Adrenal gland, Cortex - Inflammation, Acute in a female B6C3F1/N mouse from a chronic study. 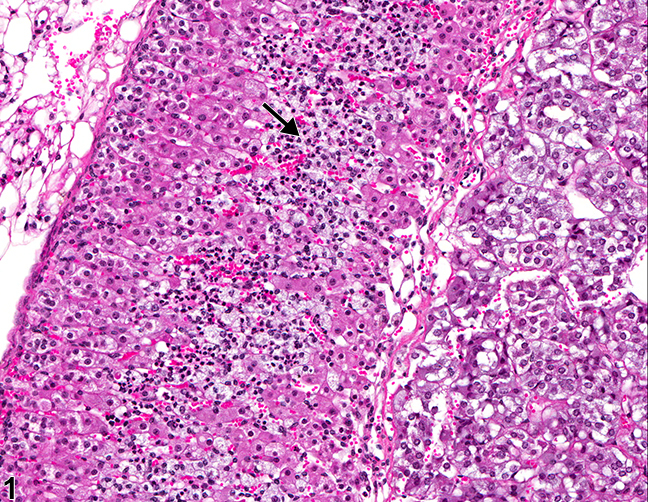 There is infiltration by neutrophils (arrow) in the zona fasciculata with associated cortical cell degeneration and necrosis. 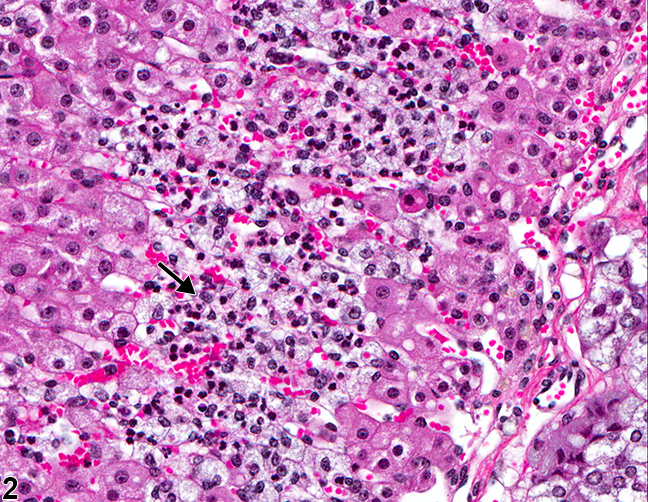 Adrenal gland, Cortex Inflammation, Acute in a female B6C3F1/N mouse from a chronic study (higher magnification of Figure 1). 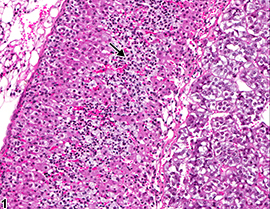 There are neutrophils (arrow) in the sinusoids of the zona fasciculata with associated degeneration and necrosis of the cortical cells. Inflammation of the adrenal gland is uncommon in F344/N rats and B6C3F1/N mice. It is usually secondary to systemic disease or as an extension of inflammation in adjacent tissues, such as the kidney or retroperitoneal fat. 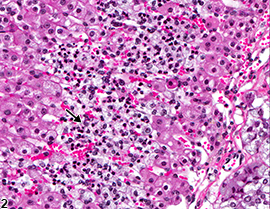 Adrenal gland inflammation must be distinguished from extramedullary hematopoiesis (foci of immature hematopoietic cells) and from systemic lymphoid or hematopoietic neoplastic infiltrates (poorly differentiated, often anaplastic cells usually in extensive accumulations that distort or obliterate normal glandular architecture). In NTP studies, there are five standard categories of inflammation: acute, suppurative, chronic, chronic-active, and granulomatous. Acute inflammation is characterized by infiltration of neutrophils ( Figure 1 and Figure 2 ), which may be accompanied by eosinophils and macrophages, and occasional mast cells, lymphocytes, and plasma cells. Suppurative inflammation is characterized by discrete pockets of degenerate neutrophils and cellular debris. There may be evidence of chronicity, such as fibrosis and lymphoplasmacytic infiltrates, surrounding these pockets. Chronic inflammation is characterized by the presence of mononuclear cells (lymphocytes, macrophages, and plasma cells) and may be accompanied by fibrosis. Chronic-active inflammation is characterized by coexistence of elements of chronic inflammation (lymphocytes, macrophages, fibrosis) and superimposed acute inflammation (neutrophilic and/or eosinophilic infiltrates). Granulomatous inflammation is characterized by accumulations of macrophages, multinucleated giant cells, and variable numbers of lymphocytes and plasma cells, or neutrophils. Inflammation is differentiated from cellular infiltrates by the presence of other changes, such as edema, hemorrhage, degeneration, necrosis, or other evidence of tissue damage. Adrenal gland inflammation should be diagnosed and assigned a severity grade and appropriate type modifier (e.g., acute, chronic). A site modifier (i.e., cortex or medulla) should be included in the diagnosis to indicate the location of the lesion. If it is present in both the cortex and medulla, the site modifier may be omitted and the location described in the pathology narrative. If the adrenal inflammation is part of a systemic process or an extension of inflammation in adjacent tissues, this should be noted in the narrative. Associated lesions (e.g., necrosis, hemorrhage) should be diagnosed separately only if warranted by severity. If inflammation is present in both adrenal glands, the modifier "bilateral" should be included in the diagnosis (lesions are assumed to be unilateral unless otherwise indicated). Kanczkowski W, Chatzigeorgiou A, Samus M, Tran N, Zacharowski K, Chavakis T, Bornstein SR. 2013. Characterization of the LPS-induced inflammation of the adrenal gland of the mouse. Mol Cell Biol 371:228-235. National Toxicology Program. 3011. NTP TR-564. Toxicology and Carcinogenesis Studies of 1-Bromopropane (CAS No. 106-94-5) in F344/N Rats and B6C3F1 Mice (Inhalation Studies).